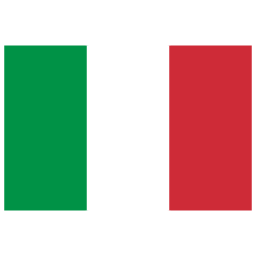 Non-Italian players who want to access Italian networks are kindly asked to contact us! Contact Us on Skype for a People's Poker Rakeback Deal! ItalyPokerDeals is offering you a customized People's Poker rakeback deal, according to your monthly rake volume: the more you rake, the higher the deal. Get your People's Poker rakeback deal right now! Peoples Poker cashback amount will be paid to your poker account or to your ewallet, Skrill or Neteller, around the 15th of every month, for your activity in the previous month. Please contact us on our Skype ID: ITALY_PKR for more details and for testing a People's Poker account. Customers who register a NewGioco account will benefit from a 100% up to €1000 People's Poker Welcome Bonus. In order to be eligible for the bonus, you must complete the account verification procedure. Please be aware this NewGioco Welcome Bonus can be cleared on Sports Betting only at the moment. In order to get this bonus, you must place 5 bets within a day (from 00:00 to 23:59) and each event on the ticket must have at least 2 odds. The next day you will receive a €5 bonus which can be used in Sports Betting as well. This procedure will repeat until reaching the amount of your first top-up. The particularity of this network is that they are not offering 6max tables. 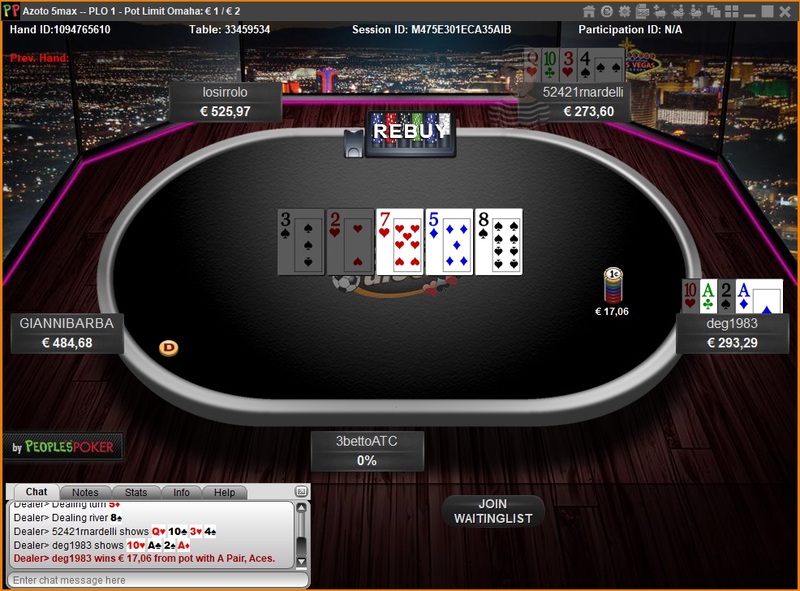 At the moment, you can join 2max (HeadsUp), 4max, 5max and 9max games. In case of No Limit Holdem, the highest games offered are €5/€10 and you can find action at these tables every day. In case of Omaha, the highest games offered are €2/€4 and the games at this level run every day as well. Direct cashier is available in NewGioco. Please find below the payment methods and their details. NewGioco is charging 2% for Skrill deposits while most of the main People's Poker skins charge 3.5%. At the time of writing of this review, Neteller payments are not available in NewGioco, but they are available in most important People's Poker skins. Rake charged at the tables is a little bit above average but this is understandable since Italy is a restricted and regulated market where online gambling companies must pay taxes to Italian regulator AAMS. In case of Texas Holdem games the charges start from 6.67% of the pot at the smallest stakes €0.01/€0.02 and then decrease down to 5.05% as we go up to the highest stakes €5/€10. In case of Omaha games the rake charged at €0.01/€0.02 is 6.67% and it goes down to 5.05% at €2/€4 games. People's Poker is the registered trademark of Microgame SpA, the leading gaming service provider in Italy, for both online and offline sectors. Microgame SpA is offering their services to more than 90 brands, from which 37 are online dealers and they have more than 650000 registered gaming accounts and they process more than 160 million transaction a year. NewGioco is one of the new skins launched in People's Poker network, but they are rapidly increasing their player pool because of the good services they are providing and the reputation they built in the Italian poker market. 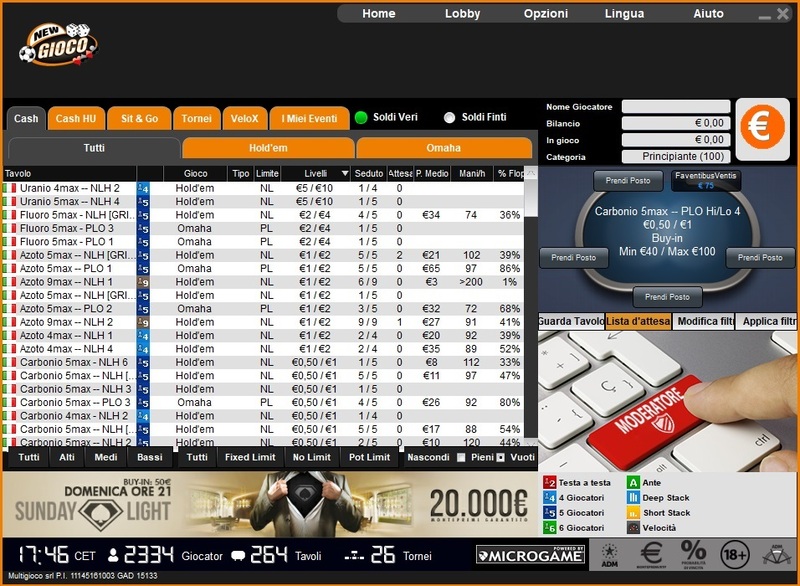 Holdem Manager and Poker Tracker can be used with People's Poker software, but a 3rd party hand grabber is required because the client does not automatically save the hand history. 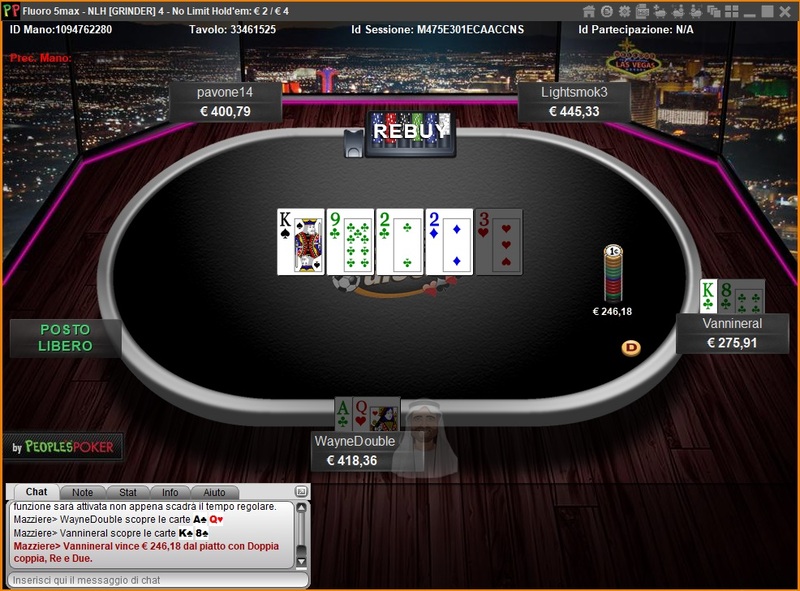 Besides the downloadable poker client, NewGioco is also offering a browser play option. 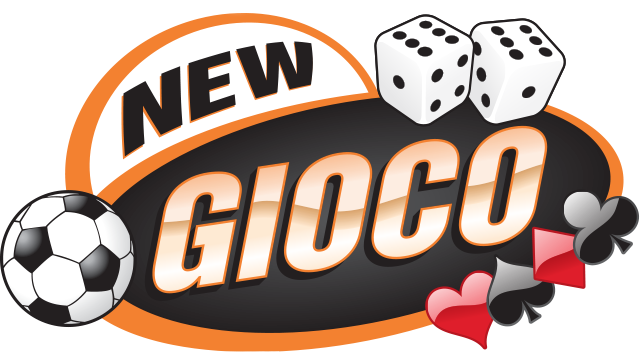 NewGioco apps are available for iOS devices (iPhone, iPad, iPod) for cash games only and for Android devices for all games. NewGioco accounts can be accessed from almost any country in the world, without an Italian VPN. NewGioco poker client can be downloaded and installed without being required to log in the website, but in order to check the lobby, you need to log in. NewGioco has a very well structured "My Account" section, with easy access to all significant information you might want to check. Their "Reports" section includes a "Rake" tab where you can check the rake amount you generated at both cash and tournaments tables and your winnings. Bumhunting is not allowed by the network and if you do not stick to this rule, you will get banned. First ban is for 2 days, but it can increase up to several days if you keep doing things they do not accept. 1. 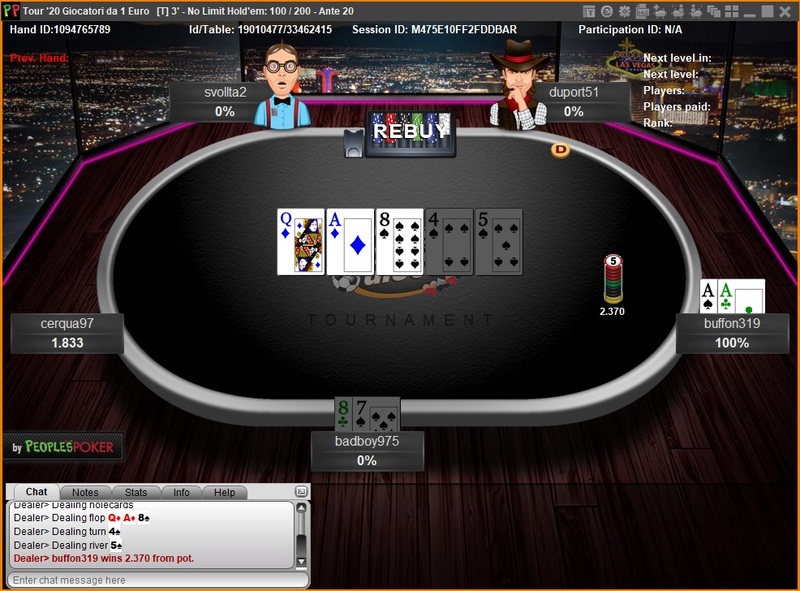 A player is allowed to sit and wait at no more than 1 HU table per stakes in any circumstances. 2. 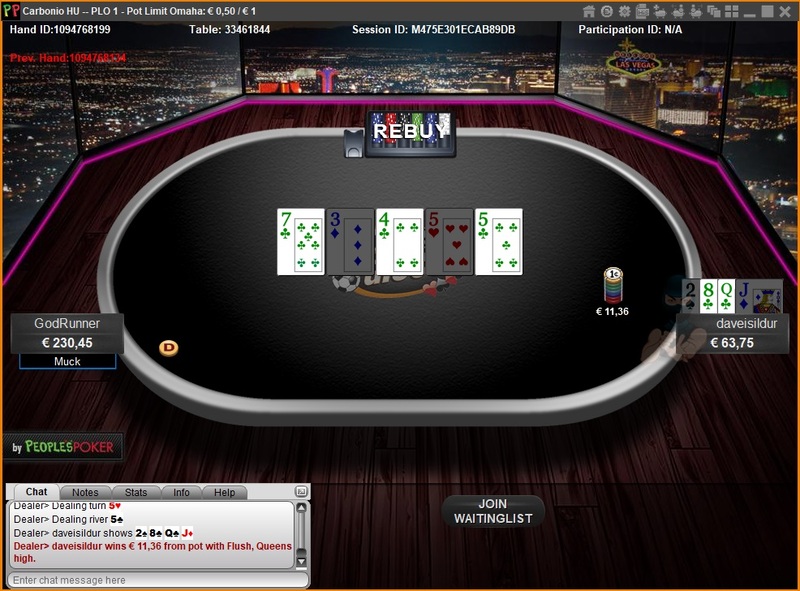 A player is allowed to sit at the 2nd HU table only when at the 1st table (where he was seated and waiting) an opponent joined and the game started. 1. Allowed scenario: Waiting at 1 x 200nl table. 2. Allowed scenario: Waiting at 1 x 200nl table & at 1 x 400nl table. 3. Not allowed scenario: Waiting at 2 x 200nl tables. 4. Allowed scenario: You are waiting at 1 x 200nl tables. An opponent joins the table and the game starts. Now, you are allowed to sit and wait at another 200nl table. 5. Not allowed scenario: You are playing 2 x 200nl tables and you are waiting at a 3rd 200nl table for a new player. An opponent from one of the active 200nl tables leaves the game, so you are now playing 1 x 200nl table and waiting at 2 x 200nl tables. This situation is not allowed according to People's Poker policy. If the Heads Up games rules are repeatedly breached, your People's account will be suspended and the bans duration will increase from 24 hours for the 1st ban, to 3 days, then 7 days, 1 month, 3 months and it can be extended up to 6 months. As in any other poker network, chip dumping and collusion are not allowed in People's Poker and breaching these rules might result in getting your account locked and your balance confiscated. - games softness : Italy is well known as being the softest market in online poker because Italians are in love with gambling and there are a lot of recreational players spending their spare time at the poker tables. Since Italy is a restricted market, you can easily understand that the fish vs regulars ratio is very high. - services quality : People's Poker withdrawals are processed very fast to your ewallets and this is a network where things go very smoothly. Besides that, we have a very good and long cooperation with the skins of this network. - People's Poker rakeback deal offered : cashback is always welcome and will increase your winnings at the end of the month. - software friendliness : Peoples Poker software is user friendly, with several features, supports trackers via a 3rd party grabber. All these will ensure your poker experience is very relaxing and allow you to concentrate on your game. Our customers are happy with People's Poker network and most of our regular players have very high win rates. In such soft games it's not even required to have too much skill. So wait no more and get your NewGioco account and your People's Poker rakeback deal!